It’s that time of the year when we all start to think about fall and pumpkins. 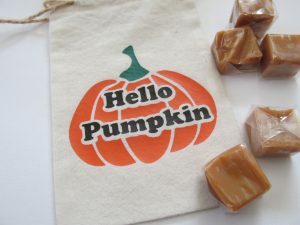 Today on the blog, I wanted to share a Pumpkin SVG that I created, and a little project that I did with it using one of my handmade muslin bags. In a previous post, I may have mentioned that I received a Wacom Intuos Drawing Tablet for a birthday gift. To put it into practice, I used it to create my own digital file for card making. I’m going to admit that I’m not as tech savvy as I’d like to be. However, the learning process is a fun challenge. I use Corel Painter Essentials 5, and it was a promotional software that I was able to get as a new tablet owner. As a crafter and craft blogger, I try to do some sort of crafting on a daily basis. It’s really a sort of exercise that I engage in to experiment and learn new things. The whole learning process, however, helps me to generate new ideas and things I’d like to share. I also like to make things that I can share with my family, as well as some things to sell online and at events where I exhibit. 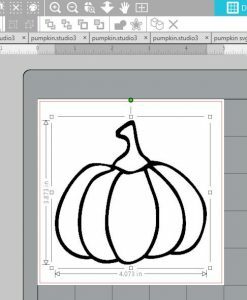 So as I brought out my Wacom Tablet, and thought about fall crafting, I decided that I wanted to try a pumpkin. 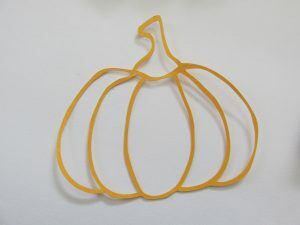 Now a pumpkin is a pretty simple thing. I could have grabbed an image from the Silhouette Store, but remember that my goal was creating to learn something new. It didn’t take me long to come up with a little drawing that would work for me. 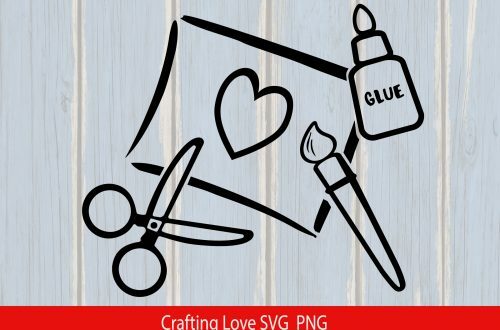 I saved it and decided to make it into an SVG that I could cut in Silhouette Studio. I’m going to assume that most of my readers that are using this SVG are going to be familiar with the import process. My Silhouette Studio is the Business Edition, so if you don’t have the Designer or Business Edition, you may have to trace your file. It’s a pretty simple looking drawing that will look more awesome as we go through the process. I hope you’ll follow along. 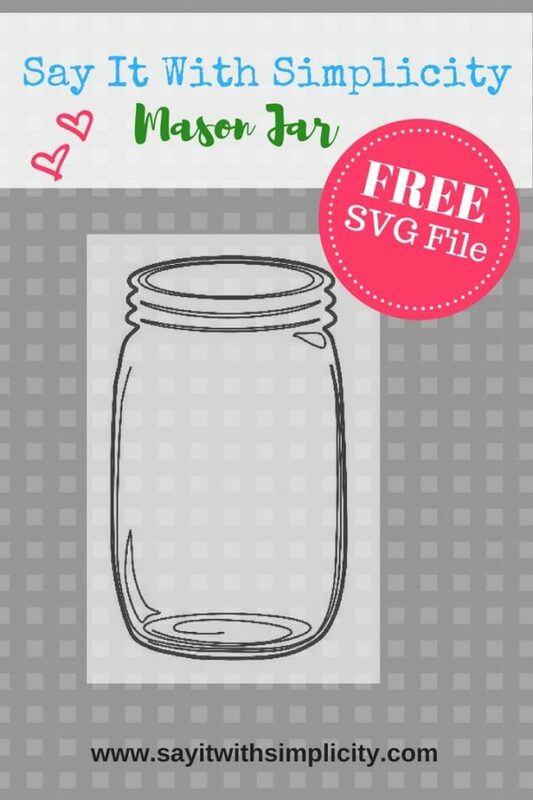 I will share a link to the SVG file at the end of this post. 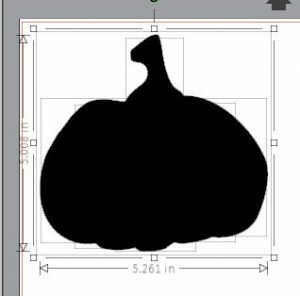 In this photo, I’ve brought the pumpkin file into my Silhouette Studio. Yes, I know it looks pretty bland. If you have to trace it though, it will be much easier this way. Your image should look something like this. 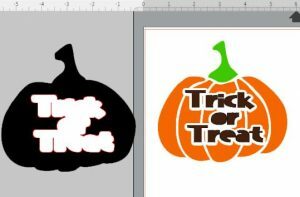 You can see the black blob pumpkin on the right, and a little more detailed pumpkin on the left. 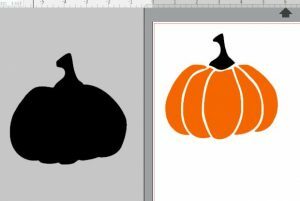 Now I’ve moved my black pumpkin outline off the mat to work with the remaining image. If you want to see what it will look like as a colored image, you can select these pieces and change the color. 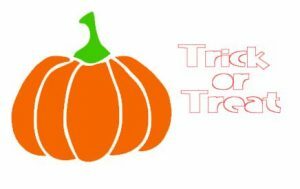 For demonstration purposes, I decided that I wanted it to say “Trick or Treat” over the top. Off to the side, I’ve added some text. 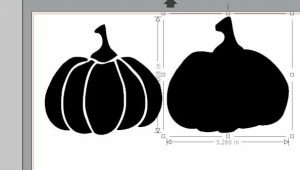 Now if you want to make a little knockout before you add your text, you can offset your text and move just the offset on top the pumpkin. Then you can select everything within the pumpkin, and everything inside and use the “Subtract All” function from the “Object>Modify>Subtract All” drop down menu. Let Silhouette Studio do it’s magic and now you can move that offset outline off your mat and move your text into your space. That’s really all there is to that. Now you’re ready to cut your vinyl for your project. Now this isn’t a super smooth outline, but keep in mind that this is a hand drawn image. To be honest, I’ve never seen a perfectly round and smooth pumpkin before, have you? One thing that I like to do is do a test cut of my file before cutting into any expensive materials. I actually cut this out of card stock at less than 3 inches tall, and even with the fine detail, it cut out perfectly. You shouldn’t have any problem cutting it on a larger scale. Create a baby onesie that says “Mommy’s Little Pumpkin” or any other pumpkin saying you wish. 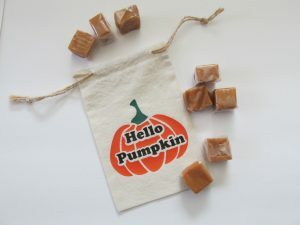 Make a canvas “Trick or Treat” bag. Put the Hello Pumpkin and some vinyl on an old pillow case to carry your pumpkin home from the pumpkin farm. 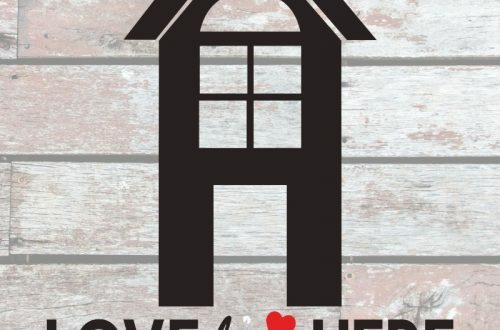 Create a sign, cute card or other craft. These are just a few quick suggestions. I’m sure you can think of more. 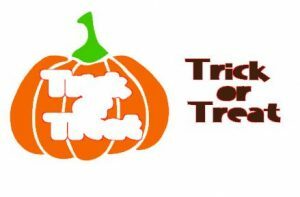 Click on the pumpkin below to get the SVG file. Note: You will need to be signed into your Google account to get this file. To download the file, click on the down load arrow in the upper right and save the file to your computer. Thanks for stopping by and have a great time creating something special for your home and family today!